Through the precise coordination of the optical and fluidics subsystems, the BD FACSVerse™ analyzer offers best-in-class optical detection, sensitivity, and flexibility for multicolor applications. The BD FACSVerse fluidics system is vacuum-based for exceptional flexibility. This allows users complete freedom to acquire samples manually from virtually any tube format and streamlines workflow. Users simply click the sample tube in place to begin acquisition. The tube holder is built into the cytometer’s chassis to make it more robust and to protect the Sample Injection Tube (SIT) from daily wear. The system can accommodate a wide range of input devices in the manual loading position, including 12 x 75-mm tubes made of polystyrene, polypropylene, or K-resin, 15-mL and 50-mL conical tubes, and 1,500-µL or 500-µL microcentrifuge tubes. The optional BD FACS™ Universal Loader further extends this list to include 30- or 40-tube racks with a microplate SBS footprint, deep and standard well 96-well plates, and 384-well plates for maximum flexibility in sample input. The unique Sample Injection Tube (SIT) design is key to the fluidics system in the BD FACSVerse analyzer. It consists of a stainless steel outer probe and an inner probe made of a high-performing polymer that descends into the vessel and draws in the sample during acquisition. This allows access to smaller diameter formats without affecting usability. When sample acquisition is complete, the sample injection tubing area is flushed, minimizing carryover. This simplifies workflow and reduces the user’s exposure to aerosols. An ingenious dual feedback system in the fluidics design controls sheath flow rate to ensure core stream stability. In addition, a thermal feedback loop maintains core stream speed with respect to temperature, giving the BD FACSVerse system unmatched stability over its entire operating temperature range. 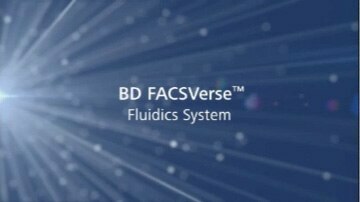 The BD FACSVerse fluidics system offers two fluidics modes.The standard mode uses three sample flow rates (high, medium, and low) at normal sheath velocity which users can select as required for their application protocols. The high-sensitivity mode uses a lower sheath velocity setting at the medium sample flow rate to support the detection of dimly stained particles. In the high-sensitivity mode, stained cells have a slower transit through the laser interrogation point, which results in higher fluorescence signal resolution. For routine use, the 5-L capacity fluidic and waste tanks can be positioned next to the cytometer or within easy access. Field upgradable extended use tanks with 10-L or 20-L capacity are also available to support up to 8 hours of continuous operation. Level detection in the fluid tanks tracks the volume of both sheath and waste. Users are alerted when capacity is low, and a shutdown of the system is triggered. The BD Flow sensor option for volumetric measurement measures the volume over the entire acquisition time. It allows the user to reproducibly obtain a precise measure of cells or particles in a volume of sample acquired by the system. It directly determines the volume of the samples as it passes through the sample injection tubing for accurate counts. The BD FACSVerse system is capable of detecting beads from BD CBA Flex Sets (A) and CBA kits (B). Keywords entered into BD FACSuite™ software are recognized in FCAP Array™ v3.0 software during analysis, resulting in a simple, robust workflow for protein quantitation.